Instead of fading away after his NFL career ended, the former player helped to develop the country's first solar city that will house up to 50,000 people. Bobcock Ranch, FL — Some NFL stars retire from the league and seek a life of relaxation and rest. Others, however, like Syd Kitson, the former NFL lineman for the Dallas Cowboys and Green Bay Packers, decided he wanted more. Instead of fading away in the background, he broke ground on Babcock Ranch—which is now hailed as the first city in America that’s completely powered by Solar. Instead of relaxing on the beach in his life after football, Kitson began development of a 17,000-acre property just outside Fort Myers, Florida with the hopes of transforming the abandoned mining land into a solar oasis, and he did. 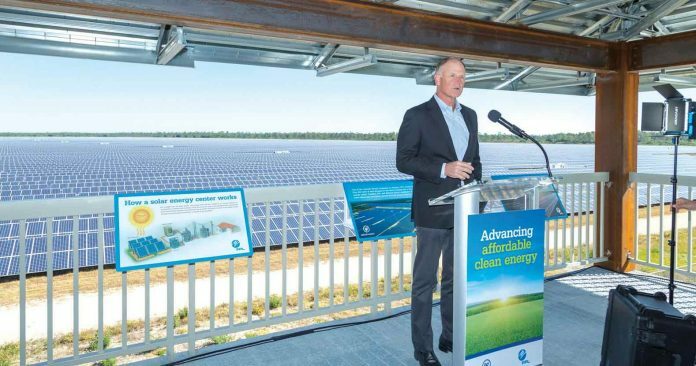 In 2016, right off the bat, Kitson’s company acquired the land and worked with Florida Power & Light to install nearly 350,000 panels with the intention of creating an entirely sustainable town. Now, his hard work is paying off as people are flocking to it. Instead of chopping out the smallest lots possible to build the most houses possible—like most developers will do—Kitson had a different vision. He took a developmental approach that ensured the town could grow exponentially in size and population and remain sustainable. In June, new residents spoke to FOX news and told them about their plans. Jasmin Day was going to give birth to the first ever baby in Babcock Ranch, Florida, and she couldn’t have been more hopeful. “Almost all the boxes are undone,” Day said, who moved to the city of the future back in June with her husband Josh and their two children. Babcock, Florida is now the country’s first fully solar-powered city with a near-zero carbon footprint. The town includes electric transportation, 50 miles of bike trails, and driverless shuttles will be next. As FOX reports, the homes run from $190,000 to about $499,000. Residents can work in the town, but are not required to do so. The fully completed footprint will eventually be 19,500 homes. The first family moved in at the beginning of the year, and a total of 250 homes are expected to be occupied by December. Eight developers are now building homes in the city which is expected to have a population of 45,000. Currently, the town is making so much power, that most of it is being supplied to other Florida residents who do not live in Babcock Ranch. While it’s not extremely common for NFL players to do great things like donate 17,000 acres to build a massive solar farm on, TFTP has reported on other selfless players in the past. Marshawn ‘Beastmode’ Lynch is is one of those players, who went to Haiti to build an elementary school. After making a reported $49.7 million in nine NFL seasons – and reportedly not spending a single penny of it (Lynch is rumored to have lived off of endorsement deals and business ventures during his career) – the likely hall of fame running back made a massive move to give back to those less fortunate. The mission to Haiti was organized by Lynch’s former Seahawks teammate Cliff Avril, who is of Haitian descent, in concert with the international charity Free the Children.